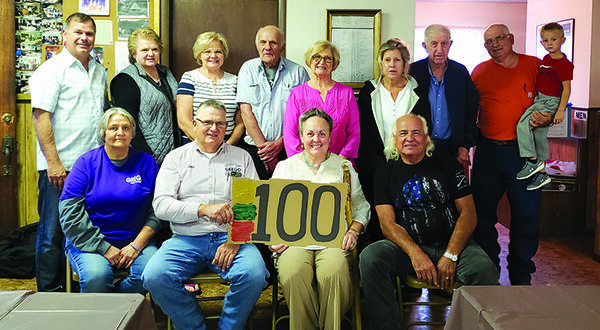 Lithuanian Oklahomans gathered to establish the Oklahoma Lithuanian Club. 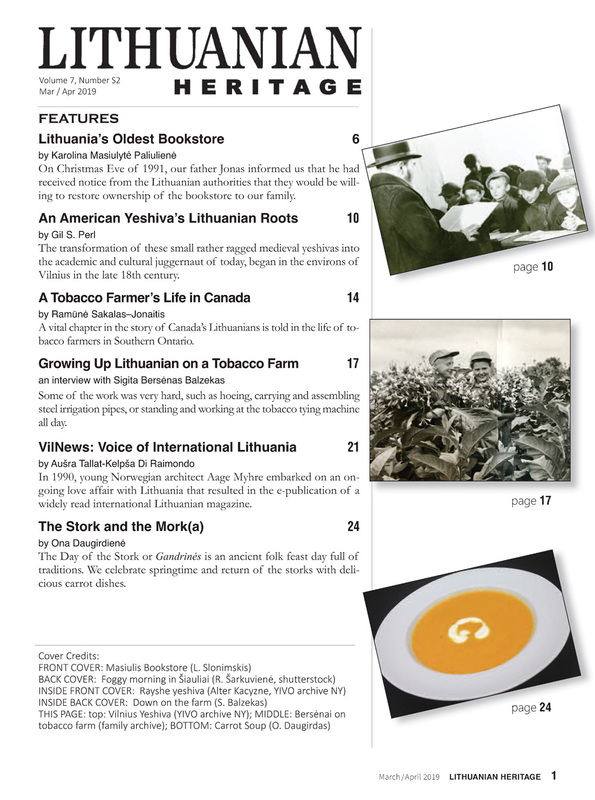 In the April 2018 issue of Draugas News, Vilius Žalpys conveyed his initial findings of Lithuanian pioneers in Oklahoma. Here he continues to report on the latest developments in this fascinating but little known Lithuanian enclave. This fall I returned to Oklahoma for a third round of research on Lithuanian settlers to the area. My trip started in the usual manner; I first traveled to Los Angeles for the Lithuanian Days Festival, October 6-7. I had helped launch this fete with Edmundas Kulikauskas and other board members and have not missed it in 32 consecutive years. At the Festival I met an Oklahoma descendant Carol Mealy who brought some photo albums. Carol’s descendants, the Polonis (Palonis) family, owned a store in Hartshorne, Oklahoma. It was located on Chickasaw Street, popularly known as “Polonis” Street, in a section of town densely populated by Lithuanians. The store catered to both Lithuanians and Poles since Mrs. Polonis was of Polish descent and could speak the language, while Mr. Polonis was Lithuanian. At its heyday, Hartshorne was the home to some 500 Lithuanians within a total population of just 2,500. From LA I made my way to Oklahoma. 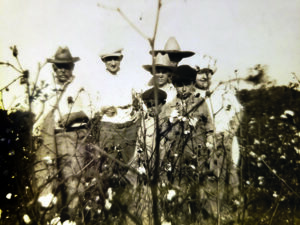 Lithuanians picking cotton in Oklahoma. At the outset of my trip, I set a few specific goals to accomplish in addition to furthering my research. It was vital to get organized. 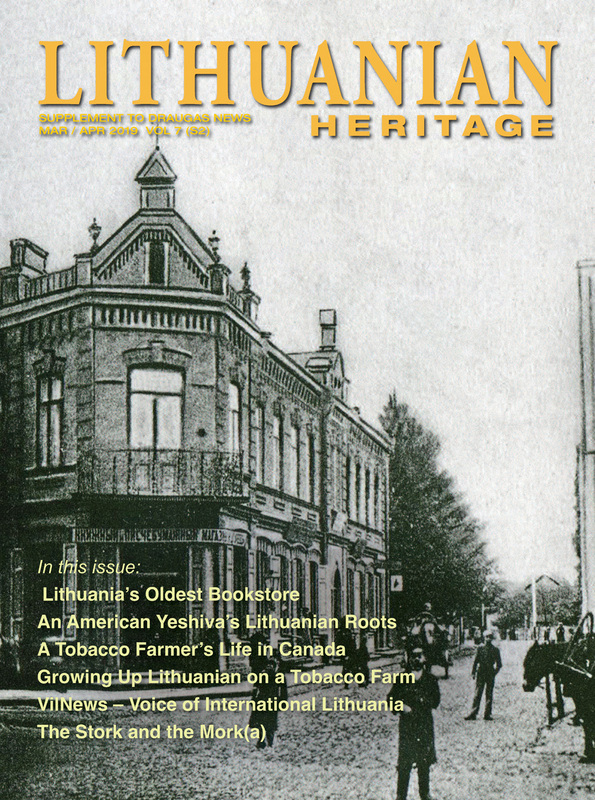 An “Oklahoma Lithuanian Club” had to be created to open up a checking account and to have a local mandate in dealing with the Lithuanian Cemetery and preservation of the historical Lithuanian log shed. On the final day of my six-day trip, we did just that. Through our Oklahoma Lithuanians Group on Facebook, we announced a meeting at the Orthodox Hall in Hartshorne. It was a blustery, rainy day but enough arrived to elect our first board. The new group’s president is Jim Grego-Grigalevičius, while the treasurer and secretary posts are filled by Phyllis Godosky-Gvazdauskas Davis, both of Latimer County. Board members at large are Virginia Budzinsky-Budzinskas Pingelton of Hartshorne and myself, William (aka Vilius) Žalpys, or as they call me in Oklahoma — Weejum. 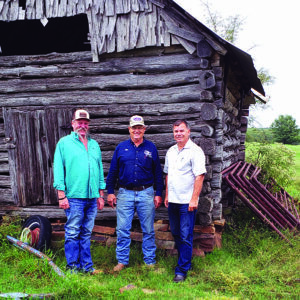 By the Lithuanian log shed: (from left) owner Delbert Derryberry, new president of the Oklahoma Lithuanian Club Jim Grego-Grigalevičius, and author Vilius Žalpys. During my last trip to Oklahoma, I discovered a log shed built in 1920 by Antanas Bratenas and his sons and used as a blacksmith’s shop. This time around I asked Jim Grego-Grigalevičius to set up a meeting with the owners of the property where the shed is situated. Jim Grego informed me that the owners, Carla and Delbert Derryberry, were willing to donate the shed to preserve that part of Lithuanian American heritage. Our meeting was confirmed with a photo and an old-fashioned gentleman’s agreement — a handshake. That’s Oklahoma for you! While in Lithuania this summer, I had visited the National Commission for Cultural Heritage or “Valstybinė kultūros paveldo komisija” which was interested in both the Lithuanian shed and cemetery. Now that the shed has been gifted for preservation, I will let them know, but I’ll also contact the Oklahoma State Historic Preservation Office and see if they are interested in conserving the shed. Bathing in Oklahoma. 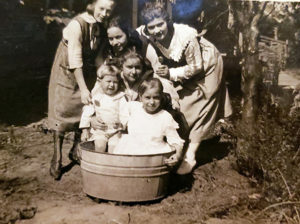 A photo from the personal archive of Carol (Palonis) Mealy. In the Draugas News April 2018 article I recounted the discovery of a Lithuanian cemetery near Wilberton, Oklahoma, which remained hidden in a cow pasture for the last 70 or more years. On this trip, I wanted to excavate a small area where we believed the removed Lithuanian grave markers were possibly buried. I also hoped that the GeoModel company would perform some underground imaging to determine how many burials still remain in the cemetery. A few weeks before my trip, however, the company informed me that they would not be in Oklahoma for some time. I had already planned my trip and requested time off from work, so I made the journey notwithstanding this setback. Before my arrival, Jim Grego-Grigalevičius sent one of his workers to mow the cemetery and arranged to mark the locations of gas and optic fiber lines, but the underground imaging will have to wait until next spring. A most generous benefactor. 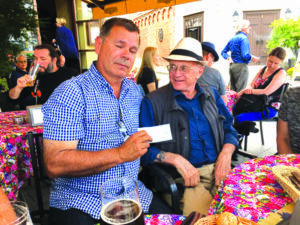 San Francisco attorney Donatas Januta (r.) presents Vilius Žalpys with a check to underwrite the underground imaging of the Lithuanian Cemetery. While in Vilnius this past summer I scheduled to meet with Sigita Šimkuvienė, the then President of the Lithuanian American Community organization at an outdoor café. When I arrived, I was surprised to see an old friend of mine, Donatas Januta, sitting with her. I fondly reminisced about Donatas’s father, Kazimieras Januta of Los Angeles, and Donatas inquired about my Oklahoma project. At one point I turned to speak with my wife, and when I turned back, Mr. Januta presented me with a check for $3,000 to underwrite the underground imaging of the Lithuanian Cemetery. It was a heaven-sent gift. Thanks again, Donatas. A young Choctow woman in native costume. To further educate myself about the Choctaw Nation where the Lithuanian immigrants settled, I took a trip to their Capitol. The Choctaw lived in Mississippi before they were forced to relocate in 1830 along with five other tribes into “Indian Territory” now called Oklahoma. Two other tribes later joined them. They were not to be left in peace, however, because high-grade coal was discovered on their territory. Coal companies laid train tracks to the Choctaw Nation. Lithuanian immigrants began to arrive as early as 1875 to work on the railroads and later to mine coal. 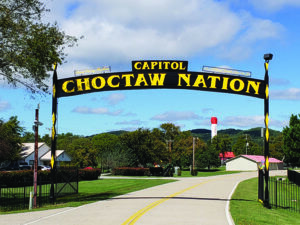 The Choctaw have their own court system, police, school system, and government but their Nation is mixed with American towns and cities that have their own governments under Oklahoma law. 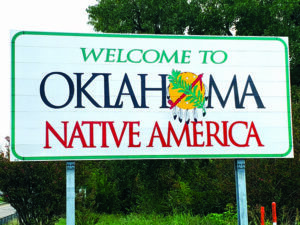 Non-native Americans could not own land in Choctaw Nation until 1907 when Oklahoma became a state. That was also when the sale of alcohol became legal. 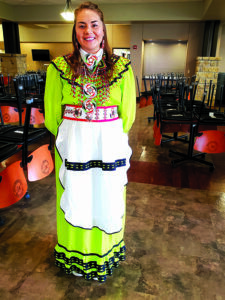 At the Choctaw Nation Capitol near Tuskahoma I was fortunate to meet a group of Choctaws preparing for a dance recital. One girl, dressed in her native costume, asked if I needed help. I asked to take her picture. I toured an open-air Choctaw village and I visited their Museum. Another area where Lithuanians once lived and worked is Coal County, Oklahoma. I spent half a day at the genealogical society located in the local library of the town of Coalgate. As expected, I found information to add to the Oklahoma Lithuanian book. It’s a blessing that so many of these small towns have preserved Catholic church records which are sources of invaluable genealogical data. 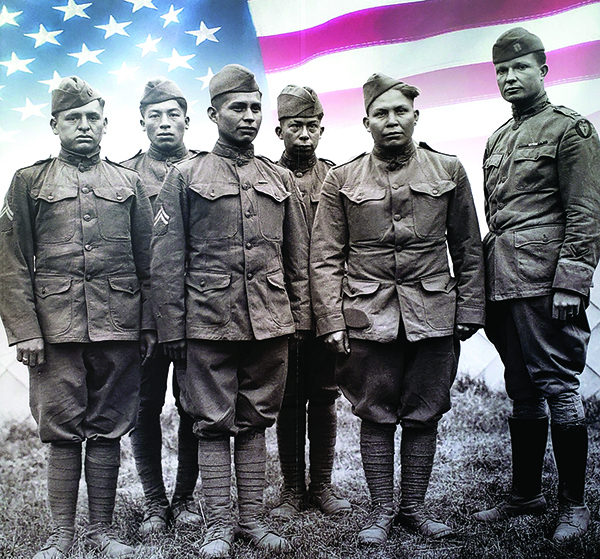 100 years ago… Many Choctow men joined the American Expeditionary Forces (AEF) on the Western Front of World War I. They were called “Warriors Armed with Words.” The Choctow language was used to send coded messages. Choctows handled field telephones, translated radio messages and wrote field orders carried by runners. 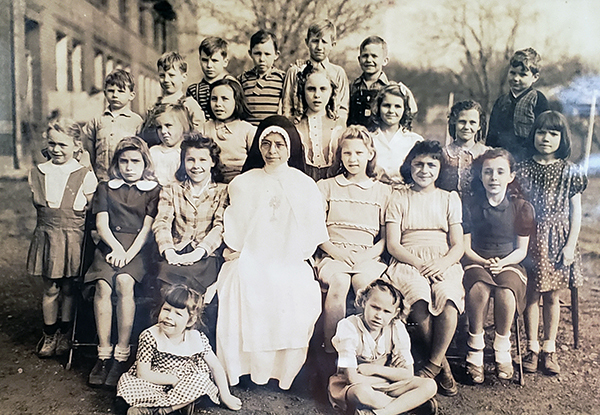 A photograph discovered while doing research on Holy Rosary Catholic Church School in Hartshorne, Oklahoma. There are several Lithuanian children in the picture.